In the Anglo-Saxon period, Dunwich was the capital of Kingdom of the East Angles but the harbour and most of the town has disappeared over time due to coastal erosion. At its height it was an international port similar in size to 14th-century London and it was a succession of 13th & 14th century storms that propelled its destruction, significantly the Grote Mandrenke (Great Drowning of Men). Sea surges created by Atlantic storms, coinciding with high spring tides, continued to bite and the last of eight churches fell off the cliff edge in 1919 although a single tombstone remains (at the moment). Human bones from churchyards swept into the sea are sometimes found on the beach and, according to local legend, church bells can be heard ringing beneath the waves on stormy nights. There’s a neat Museum in the village that explains all this with great clarity. 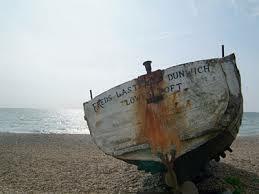 From a great city port, Dunwich became a tiny coastal village (with one last pub). Here geography takes many forms – dunes, pebble beach, cliffs along with forest and heath – all very popular for walking. 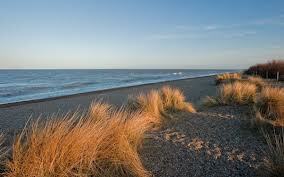 There is a lovely circular walk between Dunwich and Walberswick.